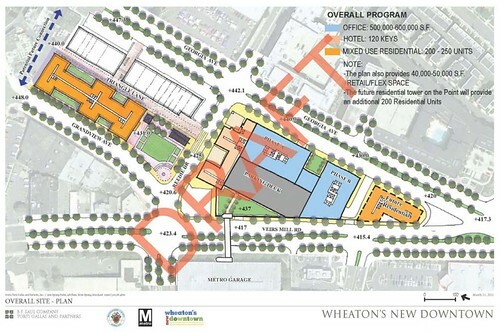 Draft site plan for the redevelopment of the Metro bus turnaround and Parking Lot 13 in downtown Wheaton. - Is the kind of development Montgomery County wants to see in Wheaton, like high-end offices, the kind of stuff the market wants in Wheaton? (Check out this draft plan from B.F. Saul, shown above.) Are there other kinds of development (I don't know what) that may be more economically feasible, but haven't been considered? - Are developers actually scared to build in Wheaton? And if so, is it because of financing, or because of other factors? For instance, are they worried about access to existing activity centers like Bethesda or Rockville, or the area's reputation (real or perceived) for crime? Or the difficulty of obtaining a liquor license in Montgomery County, which makes it difficult restaurants to open? 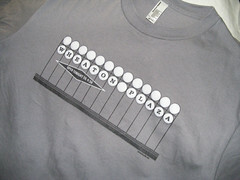 - And if we really need to "invest" public funds in Wheaton, should it go to a large developer, or to local businesses? This is the question raised by the Coalition for the Fair Redevelopment of Wheaton (an offshoot of the Latino Economic Development Corporation), a coalition of area nonprofits that includes the Latino Economic Development Corporation, which wants to see a Community Benefits Agreement as part of the county's deal with B.F. Saul. I'm not totally sure if I'm down with the Coalition's list of priorities, but I agree that the solution or "fix" for downtown Wheaton is a little more complicated than the County Executive allows. Clearly, private development is already happening in Wheaton, albeit with some county help: the Leesborough project on the former site of Good Counsel High School, the Exchange, which will include a new Safeway, and the renovation of the 1960's-era Wheaton Place apartments on Amherst Avenue, now called the Encore. All of these projects suggest that Wheaton isn't really a lost cause, and that even without $40 million, the downtown would probably continue to grow and improve on its own. Of course, one developer who's been investing in Wheaton without much help from the county has been Leonard Greenberg, who I wrote about last week for his claim (though it wasn't the first time I've heard it) that Wheaton could be "the next Adams Morgan." Earlier this week, I had a lengthy phone conversation with Greenberg, who asked to give his side of the story. Come back tomorrow for a detailed look at Greenberg's work, his ideas for Wheaton, and one possible reason why developers have shied away from the area. Sounds more like extortion on the developers' part. Can't blame them though, the time to negotiate was before they got the rights. Getting the rights to develop should have included some guarantees and milestones for what was going to be built. For a too-long minute I was wondering what fate had befallen the erstwhile Wesley Crusher. Thanks for the write up exploring what's at stake in Wheaton. To clarify, the Coalition for the Fair Redevelopment of Wheaton is not an offshoot of LEDC. We are one of seven nonprofit organizations that are members of the Coalition, which includes CASA de Maryland, Impact Silver Spring, Crossway Community, the Asian Pacific American Legal Resource Center, and the Maryland Vietnamese Mutual Association. There are definitely important questions to be asked related to the subsidy. We do think there should be strings attached to the huge subsidy for BF Saul, and we now have more than 500 County residents and small businesses who signed in support of our priorities. We want to see a revitalized Wheaton, but we want to make sure the livelihoods of small business owners and Montgomery County families are protected. Half of me says to just let Wheaton be and once NoBe and DTSS get built out then the market will naturally turn to Wheaton and Glenmont. Nothing wrong with patience. 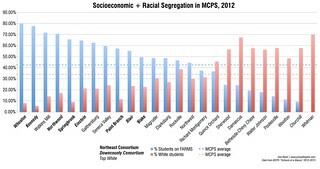 Then again, MoCo prosperity isn't a zero-sum game and if Wheaton can be coaxed a bit then there's no harm in making it a more attractive place to live/work/visit. Having lived here for going on 4 years I can say Wheaton is a mixed bag. We live in a terrific 1950's built neighbourhood and its great. Wheaton mall is up and down, presently on an up and Costco should it ever get finished will be a big boost. Dan mentions the developments going up for 2013 and so the last piece of the puzzle is to move Wheaton from being an unattractive location to a positive one. Several local businesses have failed (or are being overcharged by their developer ahem,) and we do have a lot of storefronts to fill. I feel 40 million is a lot (as it inevitably goes up over time) but Wheaton needs a kick up the backside and its exciting to think of what could be here in 10 years. If people are serious about getting Wheaton up to the status that has been talked about for years it will require cash. I say leave Wheaton alone. Not every commercial district in Montgomery County has to look like downtown Bethesda. That seems to be the goal here. No need to build a monstrosity on top of the Metro station, ESPECIALLY since Silver Spring Metro is basically a war zone for the next decade. Just keep Wheatons character, keep it Hispanic and local. Wheaton has a character that is very refreshing for those who go there. The mall is a very successful mall, so I'm not sure we need more retail outside of the mall. If anything, Wheaton needs less retail considering the amount of empty storefronts. A lot of strip malls have been built in the last few years, but for what? There's a huge mall there, no need for them. More residential.